The idea of Durban as a port dates back to 1824 when the first European settlers made a landing with the intention of setting up a trading post. The Bay of Natal (Durban Bay) was one of the few natural harbours available along the east coast of southern Africa between Algoa Bay and Delagoa Bay (now Maputo Bay). Vasco da Gama is said to have sighted the Bay on Christmas Day, 1497, when he hove to off the Bluff with his three small ships San Gabriel, San Raphael and Berrio, before naming the land Natal as a mark of respect for the Nativity. However subsequent studies by Professor Eric Axelson have suggested da Gama's 'discovery' was actually further south in the region of the present Port St Johns. A later paper by Brian Stuckenberg, director emeritus of the Natal Museum and an entomologist by training, undertook extensive research into certain aspects of the Portuguese voyages of discovery and concluded that da Gama was indeed off the present KwaZulu Natal coast on Christmas Day 1497 (Natalia Vol.27 pp 19-29). History appears to have decreed that it was while off the KZN coast and not Pondoland that the Portuguese named the land they saw 'Natal' in honour of the nativity. Since then ships called sporadically over several centuries, and who knows which honest merchantman or perhaps pirate ship sheltered behind the protection of the Bluff, that wooded peninsular that forms a dramatic landmark of present Durban. The first harbour master was appointed in either 1839 or 1840 (true records do not exist) so perhaps Durban as a port should be considered from this time. Once the notorious bar - a sandbar across the entrance channel - had been 'conquered' (a story in its own right) Durban went on to rapidly become Africa's busiest general cargo port and home to one of the largest and busiest container terminals in the Southern Hemisphere. Situated at Longitude 31º 02'E and Latitude 29º 52'S, the port is 680 nautical miles north-east of Cape Agulhas and occupies the natural expanse of Durban Bay - an area of 1850ha, with the water area being 892ha in extent at high tide and 679ha at low. From the Point to the opposite side of the entrance channel on the Bluff is 21km, with the emerging Point waterfront development and central business district to the north and northeast, Maydon Wharf in the west, the Bayhead ship repair area in the south and the Bluff Peninsular forming the southeast. Durban Bay also served a different kind of purpose in the 1930s until late in the 1950s when it was used as a base for flying boats. First it was the graceful Short C class of Imperial Airways, for Durban was the terminus of the first commercial air route between South Africa and Europe. During World War II Short Sunderlands and Catalina flying boats took over reconnaissance duties flying from their base at Bayhead, which lasted well into the 1950s. The port has a total of 59 effective berths excluding those used by fishing vessels and ship repair. The bay also has an inner anchorage. A single buoy mooring at Isipingo on the southeast side of the Bluff caters for very large crude carriers (VLCC) that are too large to enter the port. Proposals have been made to extend the harbour deeper into the Bayhead headwaters where several large container terminals will be built but this remains under consideration, as does another proposal to create a new port south of the existing harbour on the site of the Durban International Airport at Isipingo, when that facility relocates to La Mercy in early 2010. A total of 302km of rail tracks extends throughout the port area along with several major marshalling yards. The port of Durban performs a critical role within the city of Durban as an employer of people. It services its own industrial and commercial region (the second largest in SA), in addition to much of SA's hinterland including the majority of Gauteng traffic and a significant amount of traffic for neighbouring countries. In response to demand the port of Durban is maximising and creating more container handling facilities (see above) including a second container terminal on Pier One which commenced operations in 2007, but space will continue to be reserved for breakbulk and bulk cargoes. The port is served with excellent rail and road links to Gauteng in the west and points south and north. Salisbury Island, which was formerly a full naval base until it was downgraded in 2002, now hosts a small naval station, which frequently plays host to visiting warships of the South African and foreign navies. The remainder of the Salisbury Island area formerly occupied as a naval base is under consideration as an extension to the Pier 1 Container Terminal. The port of Durban operates 24 hours a day 365 days a year. The entrance channel has a depth of 12.8m from Chart Datum. The channel width has been widened to 222m at its narrowest point. The entrance channel is now 19m deep in the outer entrance shallowing to 16.5m draught in the inner channel. Prior to the widening and deepening of the entrance channel ships during daylight were supposedly restricted to 243.8m length with a maximum width of 35m and a draught of 11.9m, or 12.2m according to tide and harbour master's clearance. Larger vessels have been common and ships up to 300m length and 37m beam are regular callers in Durban. Night restrictions were for a ship length of 200m and a beam of 26m, maximum draught of 11.6m. The harbour master has to be consulted for permission regarding larger vessels. The above limitations have been redrawn since the harbour widening and deepening exercise was completed on 31 March 2010 - please check with Harbour Master's office for latest limitations. The largest ships to have entered Durban harbour were in the region of 230,000-dwt but even larger vessels are catered for in the outer anchorage. On two occasions in recent years the largest vessel afloat, the 564,650-dwt ULCC tanker Jahre Viking (now a FPSO in the Persian Gulf), which has a length of 458m and a beam of 69m underwent repairs and a survey while at anchor at the Outer Anchorage off Durban. Pilotage is compulsory for all vessels from a point three n.miles northeast of the port entrance, with a helicopter performing most pilot transfers, backed up by pilot boat service when the helicopter is unavailable. Navigation is subject to VTS (vessels tracking service system) controlled from the Millennium Tower on the Bluff including all shipping movements inside port limits. Tug assistance is required. Draught within the port varies according to location. The port operates a fleet of tugs owned and operated by the National Ports Authority (NPA). Six of these are Schottel type with bollard pull between 34t and 41t - Umzumbe (ex Otto Buhr), Umsunduzi (ex Dupel Erasmus), Umvoti (ex Bertie Groenewald), Nonoti (ex Jannie Oelofsen), Inyalazi (ex Piet Aucamp), and Umhlali (ex Bart Grove). Later type tugs of a new series of Voith Schneider 49t bollard pull tugs which were built at SA Shipyards in Durban began to be introduced from 2001. The two stationed at Durban are named uThukela and Mkhuze. Seven additional Voith Schneider-propulsion tugs of between 65 and 70 ton bollard pull are currently under construction at SA Shipyards in Durban, of which several will be placed in service in Durban. Each tug is maintained to SAMSA class 8 standard and is equipped for fire fighting and salvage. The fleet handles in excess of 800 ship movements each month and four tugs are usually on duty during daylight hours and at least two at night. The port also employs one work boat/tug of the Tern class, Royal Tern, which has a bollard pull of 18.7 tons. An Agusta A109 K2 'HPS' twin-engine 8-seat helicopter operated by Balmoral Maintenance Services provides pilotage services. Two diesel-powered pilot boats named Lufafa and Jujosi, which were built by Veecraft in Cape Town in 2009, operate when the helicopter service is unavailable. Dredging is performed by the NPA on an ongoing basis in the port and immediately outside the entrance to counter the littoral drift that would otherwise recreate the infamous Bar across the entrance channel. The major work is conducted by a trailing suction hopper dredger named Piper (ex RE Jones), with the dredged sand deposited into a reclamation point on the northern breakwater, from where it is dispersed by the municipality along Durban's northern beaches. Piper loads 2,500 cubic metres at a time. The Richards Bay dredger Ingwenya often assists in Durban. A new suction hopper dredger is currently under construction in Europe and is expected to enter service early in 2011. Other harbour dredgers include the bed leveller dredger named Impisi (ex LL Varley), which operates by dragging a plough across the seabed to move accumulated silt against the wharfside into the adjacent channel. The channels are kept clear by means of the grab dredger, Crane (ex JF Craig), which uses a grab attached to a crane on the vessel. Crane (named after the bird) and Piper or Ingwenya also operate at East London and Port Elizabeth as required. Hydrographic Survey Vessels used at the Port of Durban are the Ingwegwe and the Swift. Durban has two floating cranes. Indlovu has a lifting capacity of 235 tonnes at 10m and 125t from 24m. The smaller Imvubu is privately owned by Elgin Brown & Hamer and has a lifting capacity of 60 tonnes at 6.1m or 40.6t at 16.2m from the outboard edge. The port employs a number of launches and cargo punts including a 100+ passenger harbour boat named Isiponono, which is used for trade and business tours of the port. A pollution boat named Udonti also serves the port. Several private companies provide commercial diving services and the port also maintains a fully equipped diving team. The NSRI, which has moved into a modern station base at the Point, operates several deep-sea and smaller rescue craft. The port of Durban handles the greatest volume of sea-going traffic of any port in southern Africa. For the 2008/09 financial year ended 31 March 2009, the Port of Durban handled a total of 4,554 sea-going ships with a gross tonnage of 114,723,266 or about 38 percent of the ships calling at all South African ports. Cargo handled during the fiscal year 2008/09 amounted to 74,683,597 tonnes, which included oil and petroleum products and containers. Total tonnage handled by the port (including a calculation for containers) constituted 42,559,842t of imports, 23,516,461t of exports and 8,607,293t of transhipment cargo giving a total tonnage for the port of 74,683,597 tonnes. Bulk cargo handled at the port in 2008/09 was 34,205,900t, of which imports were 27,068,586t, exports were 7,055,419t, and transhipments totalled 81,895t. Breakbulk cargo totalled 5,912,756 tonnes, of which imports were 2,690,057t, exports 3,033,254t, and transhipments 189,445t. Container volumes (2.56 million TEUs) totalled 34,564,941 tonnes (see below). The combined Durban container terminals handled 2,560,366 TEUs (twenty foot equivalents) during 2008/09 of which imports were 948,237 exports were 994,651 and 617,478 TEU were transhipped. Included in the above were 40,900 TEUs that were shipped coastwise. Containers handled at Durban represented 67,4 percent of the total number of containers handled at South African ports. The Durban Car Terminal - the country's largest import and export facility for the motor industry - handled 372,557 motor units, of which 184,511 were imports, 182,091 exports and 5,955 were transhipments. Note: The latest monthly statistics for the port can be found in the general News section of PORTS & SHIPS, on a monthly basis (usually around the 8th to 10th of each month) with the annual figures publsihed early inJanuary (calendar year) and April (fiscal year). Readers should make use of the built-in Google search engine (top right side of each page) to locate - key in the name of month or year required followed by the word statistics. The port of Durban operates on a common user basis and consists of five business units managed by Transnet Port Terminals or TPT [formerly known as SA Port Operations (SAPO)] - Durban Container Terminal (Africa's busiest), Pier 1 Container Terminal, Multi Purpose Terminal (also known as the City Terminal), Durban Car Terminal (three berths), and Maydon Wharf Terminal. There are a number of other terminals in the port which are managed and operated by private companies, including the Bluff Coaling Terminal known as Bulk Connections, the large Island View oil and petroleum complex, often referred to as the Cutler Complex or simply as Island View, the Fresh Produce Terminal at the T-Jetty and another fruit terminal at Maydon Wharf, the Sugar Terminal and Wood Chip Terminal on Maydon Wharf, SA Bulk Terminals (Rennies) on both Maydon Wharf and Island View in addition to a number of other private facilities mostly at Maydon Wharf. The port has a well-equipped passenger terminal at N-berth on the T-Jetty for the convenience of cruise ships, which operate mostly during the summer months between November and May. During the summer each year MSC and Starlight Cruises base a cruise ship for all-summer cruising at Durban, operating to the Mozambique and Indian Ocean island destinations. The 'resident' cruise ship during the 2009/10 season will be the MSC SINFONIA but during the 2010 FIFA World Soccer Cup tournament several cruise ships will remain in Durban to be used as floating hotels. These and other cruise ships make use of one or more berths as required and at times the port can have as many as three cruise ships in port together. An attractive Harbour Expo Market is mounted in the airconditioned N-Shed while cruise ships are in port (contact +27 083 434 8365 for details). Long-term plans foresee a new cruise terminal being built at A berth on the Point, near the Point Waterfront. Extensive ship repair facilities consist of a graving dock divided by two compartments with a total length of 352.04m and a width of 33.52m at the top, split into an inner dock of 138.68m and an outer dock of 206.9m and serviced by up to five electric cranes from 50t to 10t. Not all the cranes are in use or serviceable. Emptying time for the graving dock is 4 hours. There are proposals to build a private dry dock at the Dormac Marine shipyard. In addition to the above mentioned dock the port of Durban has three floating docks - one operated by Transnet NPA with an overall length of 109m, a width of 23.34m and a displaced lifting capacity of 4,500 tonnes, serviced by two 5-tonne capacity cranes. The second floating dock, known as Eldock, is operated by Messrs Elgin Brown & Hamer and is currently the only privately owned floating dock in South Africa (Elgin operates two similar floating docks at Walvis Bay, known as Namdock 1 and Namdock 2). Eldock has a length of 155m, a width of 23.5m and a lifting capacity of 8,500t. The third floating dock, a smaller unit of 50m length is due to arrive in Durban during June and will be utilised initially as a launch vessel for the fleet of new tugs being built at SA Shipyards. This dock may be introduce for small ship repair at a later date. Bayhead has two general repair quays in addition to several privately operated and fully equipped repair quays. Two bunkering companies - Smit Amandla and Unical provide bunker barging services with modern double-hulled barges but no bunkers are served outside the port. There is an extensive safe anchorage outside the port for vessels waiting for berthing or for orders. Durban has three marinas for yachting purposes - the main marina opposite the Esplanade, served by the Point Yacht Club and Royal Natal Yacht Club, the Wilson's Wharf marina used predominantly by motor craft and the Bluff Yacht Club facility in the Silt Canal near Bayhead. The Silt Canal also houses a number of other marine activity clubs. A new marina is envisaged for the area immediately outside the harbour entrance (between the North Pier and Vetch's Pier) and has recently received approval from an environmental impact assessment and regulatory process. Construction is expected to commence during 2010. The port and city authorities also propose a combined marina development in the area between Wilson's Wharf and the Tug Basin (Bat Centre) which if it proceeds would be developed as a waterfront. A large number of other recreational activities take place in Durban Bay including canoeing and kayaking, parasailing, fishing from boats and bird watching at the Heritage Site (mangrove swamps). 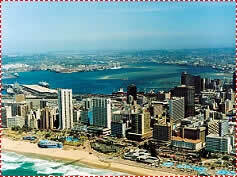 Public sight-seeing is available from a variety of ferries and launches operating such services in Durban Bay. These ferries may be located at Wilson's Wharf, the Durban Marina and near the Bat Centre - readers shoulds consult the Ports & Ships MARITIME SERVICES DIRECTORY for details. The port has a full range of ship chandling and stevedoring available - details of all these are also available in the Ports & Ships Maritime Services Directory. In addition Durban has a interesting Maritime Museum located near the Bat Centre (opposite Aliwal Street) which includes several tugs, a minesweeper and other large and small exhibits. There is a small charge for entry and parking is available.